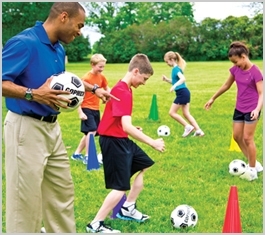 ACHIEVE!™ is the answer to creating an effective physical education curriculum or an easy-to-implement before or after school program. ACHIEVE!™ utilizes a combination of standards-aligned content, easy-to-use lesson plans, convenient instructional videos, personalized training, and premium equipment to provide the ultimate solution for your school or institution! 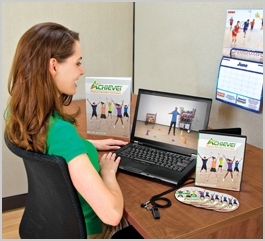 ACHIEVE!™ provides all the tools needed for easy implementation of a quality program! Master schedule provides an organized plan for the year. Teacher guides and detailed lesson plans clearly outline each activity. DVDs support each lesson, providing visual instruction and guidance for teachers and students. Instructional content is PhD authored and aligns with state and national standards. Activities are organized in a sequential, age- and ability-appropriate format. ACHIEVE!™ curriculums are researched with evidenced-based results. ACHIEVE!™ programs offer expert content, on-site training, and high-quality equipment for the most comprehensive curriculums! Improve activity and reinforce healthy choices. Personalized on-site training increases engagement and understanding, while optimizing your time. Programs come with content-specific equipment backed by the best guarantee.